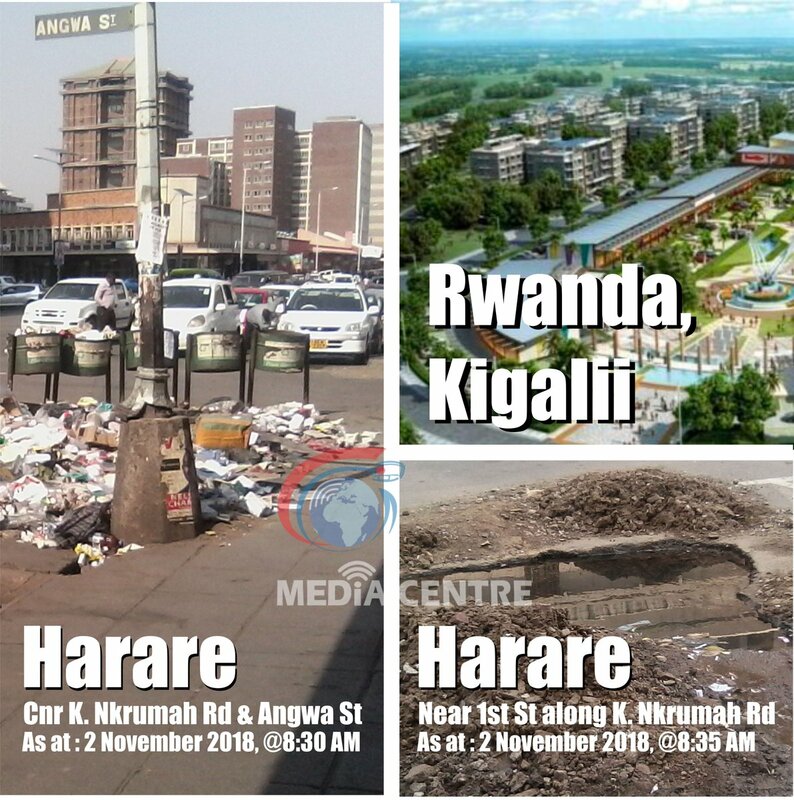 Unpleasant heaps of garbage at Corner Kwame Nkrumah Road and Angwa on the 2nd of November and unusable bins near Corner First and Jason Moyo in the Central Business District (CBD) of the capital city of Zimbabwe, lies in stuck contrast with City of Harare’s claim of a world class city by 2025. Waste is the main problem which the City Council is trying to solve by chasing out vendors, destroying shanty structures at market places of Mupedzanhamo and Copacabana, but heaps of garbage strewn all over the streets tell a different story. Garbage massed at Corner Kwame Nkrumah Road and Angwa which acts like a collection point, paints a picture of griminess that has downgraded the Sunshine City status which is the city’s pay-off line. A look at Corner First and Jason Moyo destroys the hope of Harare becoming the next Kagali in terms of cleanness as a line of dysfunctional and vandalized bins occupy the street. Garbage collection in the CBD is becoming inconsistent and this poses pollution and health hazards as businesses resort to burning their waste as is the case at Corner Kwame Nkrumah and Angwa Street were a huge pile of ash is seen. On another note burst pipes are left unattended for weeks and at times for months, leading many citizens to raise queries over the will of the city council. Water springs up almost everywhere from pipe bursts in the CBD, showing clearly the dilapidated nature of the water infrastructure and the urgent need to revamp it.